CAPblog is an unofficial journal of the Civil Air Patrol, the United States Air Force Auxiliary. The opinions published here are those of the individual authors and visitors to this site. They are not the views of the Civil Air Patrol, or the United States Air Force. An Air Force officer's blog: News. Cars. Life. Whatever. Blogging his way through primary flight training. The blog by Thirty Thousand Feet, an aviation directory. I'm posting the full text of the document to share with you. This After Action Report consists primarily of input from Capt Chris Cook of MSWG, Maj Owen Younger of TXWG, and Lt Col Rickey Oeth of ILWG, and was compiled by Maj Younger. Comments from ground teams and mission staff have also been incorporated. This mission had both successes and shortcomings. Overall, however, we were able to make contact with over 8500 individuals and provide assistance where needed, we were able to support the State of Mississippi directly, and we were able to support 1st AF and other federal agencies with imagery and transport capability. The Mississippi Wing carried the weight of this disaster on its own shoulders for many days until relief arrived. The performance of MS WG under adverse conditions, the wing’s professionalism, its commitment to service before self, and its devotion to the people of the State of Mississippi and other areas along the coast, served as an example for those who rotated in to this mission following in their footsteps. In this mission, Mississippi Wing set the standard, and the rest of us tried to live up to that level of commitment and performance. CAP has performed in a manner that should make all of us proud. Ground Team Leaders should be required to sign a blood oath to follow orders given by the IC or staff or forfeit their rights to live a free life in the USA as long as the tasks are safe, reasonable, within regulations and morally correct. :: The Katrina deployment was an amazing experience. I'm honored to have had the chance to serve with a great team of people, doing important work. We helped a lot of people during our time in the field. I'm very proud of the CAP Team. Well, not the PAWGs... but you'll see why. There are plenty of stories of the professionalism and commitment of CAP Airmen during this disaster. More importantly, there are critical lessons that were learned here. Most of the mistakes made during during a mission of such unprecedented scope are forgivable... repeating them the next time around is not. I am inspired by this report. This confirms why I enjoy hanging out with guys who love their country enough to do what we do for free. But... We have really got to fix the unity of command issues that are evident in the AAR. This is precisely WHY I think our best bet is to reorganize CAP as an element of the Air National Guard. They have already worked through the very command-and-control issues that we are dealing with, and their solutions can be our solutions. Also, in the unlikely event that a GTL disobeys the order of the IC, action can be taken that will be much more memorable than a stern look and a disapproving word. Written orders would be cut assigning teams from other wings to the wing that is affected by the disaster, so that everybody would know their command relationships. Mission authorizations would come from the Adjutant General, who would command all military assets of the state. Coordination with other Guard and Federal units would be simplified, since they would all be under one boss. I'm open to discussions and suggestions on this, but in my humble opinion, I've hit on the magic bullet to slay the organizational monster that tries to ruin all our missions. I think it's wonderful that someone who never showed their face at our base can comment on exactly what happened, since a large portion of it is inaccurate. Aren't AARs to be conducted by everyone involved, not just a few high ups? Whatever the case, I'm glad they point fingers down instead of up. 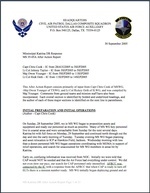 The AAR document was compiled by the Incident Command staff. It states that comments from the hotwashes performed with ground teams and air crews during demobilization were included. From what I saw during my experience of being posted to FOB Stennis as a Ground Team Leader, the AAR seems to me as accurate. If a large portion of the AAR is inaccurate, like you say, I'd like to hear what points you take issue with. Please be specific. I'm sure that this AAR will guide doctrine going forward, so it better be able to withstand peer review here. I didn't see anything in there that I didn't see personally, or that wasn't presented by hands-on parties with evidence to back up their claims. See, that's the difference between an anonymous posting and an official report presented to higher HQ's. Here you can pretty much say whatever you want. Written reports better have evidence to back the claims. Please, pray tell us where the inaccuracies lie so that they can be corrected. Make sure to be as specific as possible! Oh boy, got to watch this... it's a good thing I helped write a bunch of malarkey! Just reading some of the comments. Ihavent seen this AAR yet, but I wil tel everyone this from someone who conducts AAR's professionally in the military. Before we conduct any AAR, we go over the rules. One of the rules is you HAVE to have thick skin. You cannot get mad becuase somene says something negative about you. AAR's are based on each indivisuals perseption of the event. It is not a slam on any one perosn. You cant take it perona and get mad and snap back at he person. Then AARs become arguments and nobody learns. I was not there but this AAR seems to repeat the sames concerns several times which leads me to believe that what they are saying has some merit. We (CAP) dot not train on a regular basis for significant incidents of this scale and it will be a great learning tool for us. This document should be reviewed by every Wing CC and every ES officer within the organization for a honest review of each units local abilities should another incident of this nature occur. I am interested to hear about the problems with the PAWG Ground Team...What were the specific problems? AARs are conducted with the input of ALL parties concerned. The referenced "AAR" was written with the input of a very few people - many with specific hatred of a specific wing. There were NO "daily flights bringing MREs and water" to the FOBs. ZERO food and water was sent by CAP to most of the bases. None. One wing's personnel seemingly rewrote 39-1 by wearing numerous unauthorized patches on the BDUs and even red cross armbands. Not that big of deal but these folks shouldnt be the ones to cast stones about other troopers uniform issues. The "official AAR" has ZERO input from over 75% of the CAP personnel who were deployed in support of this mission. Where is the AARs objective review of the "CAP ICP"? Supposedly this location had only one or two phones, no fax machine and not even a white board on the wall. Where is the AARs objective review of the CAP ICPs *DEMAND* that 'urgent need' forms go from the field to them with the impossibly unrealistic promise that "we will see that these get sent back down to the appropriate agencies". Sent how? Carrier pigeon? Our CAP gurus DEMANDED that these reports - collected daily for needy residents for such important but not instantly urgent issues as dwindling medicine supplies, 02,etc - be kept overnight and sent north on the daily "Glasgow Express" flights. In one instance a team turned their daily needs forms into a civilian overhead team and was ORDERED to return to this CP and retrieve them. Insanity. The civilian overhead teams CAP worked with were using millions of dollars in homeland security dollar-purchased equipment. They got things done. Remember, the CAP ICP didnt have a fax machine, white board or adequare maps for much or all of the three weeks the mission dragged on. EVERY team that was sent to Mississippi did some things well and some things that needed improvement. THIS is what the AAR should have stressed. I personally witnessed the PAWG team attempt to brief the incoming team on lessons learned - only to have them shrug off the request with "we can handle it"
Its amusing to me that NATHQ feels my CAP grade is worth so little that I dont warrant even a photo ID card and yet "General" Glasgow caused several groups of CAP personnel to stand in formation in the sun for his king-like arrival. Where is this AARs mention of the positive logistics that CAP had? PAWG's enclosed 20+ trailer and two large modern generators, tarp "hooches" that served as a chow hall and sleeping areas, the numerous large expensive coolers that were left behind for the follow-on team that had few or none,etc etc. What about the deficiency of some teams in the same area? Including one team who didn't even have a simple bowsaw to construct a paraTP. Mission Prep??? Or the non-PAWG female CAP officer who used the CAP sat phone each evening to call home? ( to the disobedience of Gen Glasgow who explicitly stated that these were on loan from members and were to be used solely for CAP business ).Fraud, waste and abuse. How about the non-PAWG team that decided to take their showers late in the morning (because they didnt want to have to walk inthe dark) and caused several teams to get a delayed start on the days missions? Or the "doctor" (allegedly a veterinarian) who almost bowled over a nurse and army combat medic in his haste to attempt to treat a minor injury? A HUMAN minor injury. Blah,blah,blah. I could go on and on. As I have stated - a mission of this size will ALWAYS generate incredible high AND lows at the 'boots on the ground' level. Put the nit-picky petty BS aside. Gather legitimate information and publish a FACTUAL AAR. I pray for the day that the USAF exercises its rightful control over CAP. If we had even 1/4 the USAF-CAP interaction that USCG-USCGA has - we would be golden. I also hope that someone in a position of authority has the kahunas to take this "AAR", collect true information and not opinions and reformat it into a document that those who were there can learn from as well as making it useful for future missions of this type. I think JTB summed up many of my thoughts very well. I was involved with the Hurricane relief efforts as well, but not as a member of CAP. I am also a member of the Air Guard and my unit is a CRG (Contigency Response Group) we provide on demand airlift in austere locations anywhere in the world within 24 hours. We were sent to Alexandria, La. for the duration. We were at the old England AFB and we were running airlift to N.O. for the USCG. We saw USCGA elements on the ground. Most of them were aircrew members, but there were also guys from all over the country that were going down via airlift and truck to repair navigational aids. From my perspective, the contact between the active element and the Aux. element was not any "better" than that which the AF and the Aux. has. The difference was that the CG Aux. flew active observers over N.O. to do damage assessments. I think the biggest difference though is the mission of the CG. Coasties are the closest thing to active CAP members! As far as what the AAR says, I agree with Capt. Bell, you can't take anything said, or not said personally. If the IC's didn't see things and didn't get to talk to everyone, its probably b/c when you're running a mission, you're not worried about what going to go into the report. My experience as a member of the military for this mission is a bit different than the rest of you. I saw things from a different vantage point, and I got paid--its amazing what you can do with real monetary support behind you. If we needed something, it came in within 24 hours on a C-130. It's too bad, CAP can't get that level of support. We even ordered pizza and a C-130 loadmaster was our delivery guy! What CAP could do with just a fraction of that kind of support! What is the issue with a kilt? I know the guy who wore the kilt and he broke it out as a gag and as a way to lighten up the atmosphere. Someone who has served in the military would understand the need to lighten the mood after being in those sorts of conditions, especially in a cantonement area. Managing stress of one's subordinates is a leadership function. Lets face it, the Pennsylvania Hawk Mountain Rangers are pretty much the best that CAP has to offer in terms of SAR/DR. I've been to a lot of CAP activities across the country and I have never seen a higher level of competance and dedication. These people dont try or just have good intentions, they execute. A lot of people dont like the attitude the Rangers have. Admittedly, there are a lot of colorful people in the program. That said, if you are missing in the boonies or stranded on the side, there isnt anyone better to find them than a PA Ranger. I have also noticed that the largest detractors of the Ranger program are people who dont understand the program, base their opinions on rumor and innuendo, and are those who probably couldnt hack it in terms of competance and physical ability. In terms of overhead, the team that PA sent could have (and probably should have) taken over command of that mission based on the years of experience and training that was sent down. If there was disgust with the taskings or objections made, it was probably because they didnt make sense, werent feasible, or were based on incompetant planning. A 100 year disaster is no place for stupidity, buffoonery, or OJT. If you dont know how to run a mission, get out of the way and allow someone who does. How is it acceptible, for example, to run an IC post without proper forms of electronic commo equipment. A smart person would have co-located their IC Post with someone or someplace that had it. A lot of buildings and commo infrastructure at Camp Shelby...or Kiesler AFB or even some county EMA building. I wasnt there...wish I could have been to help but it wasnt in the cards. Everything that I have heard from people I have known for many years indicates to me, that IC in MS left much to be desired. All the more reason to bring in the AF to help square this organization away. Bring in people who know how to plan and execute large complex operations. PAWG guys show up wearing orange t-shirts, rarely wear blouses, and have hats that look like they got stuck in the dryer and you're gonna make an issue of arm bands? How about the 10 or 11 cadets, who shouldn't have even been there at all, who were then left largely unsupervised to play cards and other worthwhile activities while the "smokies" or "patrol boys" or "rangers" or whatever made up name they use, drove around blowing off search grids because they didnt' agree with the mission as briefed? How about the fact that when they disagreed w/ orders from the National CC AND the IC, they PAWGs called their Wing CC like a 3rd grader calling his mommie. How about the fact that PAWG's spent more time setting up their fancy base than executing mission sorties? That they spent more time trying to show everyone how cool they were with camp signs, a tree full of directional arrows (been watching too much MASH, guys), and other nonsense, they failed to actually establish the relationships w/ the base EOC and Army, etc., that were necessary to sustain the mission. We didn't need food or water from Jackson, as there was enough for most of the state if they'd taken the time to look for it - all you had to do was sign for pallets or water and MRE's, etc. How about the 90+ cases of MRE's which PAWG people removed w/o authorization? I wondder how much those will be sold for at Hurl Mountain this year? I was so disappointed in those guys I can't even begin to tell you. Ad the inbound teams from IL didn't spend much time getting a briefing from the PAWGs because the PAWG's were being sent home after nearly two days of no communications w/ Jackson, and misison sortie output which was about 1/3 of what the relief teams did on their first day, Jackson had had enough. We received the majority of our briefing from people w/ stars on their collars, and what we received from the PAWGs at the FOB was worthless. Riddle me this Batman........Just wondering, as i wasn't there, and have heard a-many-a story.........why did PAWG show up with cadets when they were specifically told not too? I know that when I was contacted to go, and stand up my team, I was specifically told NO Cadets and and under NO Circumstances no cadet under 18. Can you enlighten those that were not there to the conditions that led to the accused disobeying of orders by PAWG personnel, and those that don't like what the on scene IC says, and call home to thier WGCC?, and have them call the IC? Any mission that I have been too in my 8years of CAPdom, the IC is GOD unless a safety issue comes up. Again I wasn't there, but have heard first hand accounts of people from my unit and wing that I DO TRUST that were that says these things happened. As for the comment about PAWG Rangers being the end all everything, I do beg to differ, not being a grad of, or having the desire to be a grad of any of the Hawk programs, I myself have seen quite alot of differing ways of doing things, and I can HONESTLY say that there has been one out of 40ish people that I have met, trained with, or even worked a mission with, that I have been impressed with, or even take on a ground team in which I lead. I am by no means saying that I am an all knowing GT Buddha, but I have been around the block in SEVERAL capacities, and varying scopes of missions, so the comments, IN MY little kingdom are not that high for the PAWG Hawk program. Now I am sure that there are some that are good, "and any man that judges the group by an individual is a peewit, You take men (women) one at a time." However the reported statements to me were not complementary at all. So I would be delighted to be pontificated upon from someone that was from PAWG who was there. And can support those actions that were carried out by PAWG personnel. I know that this sounds like I am targeting PAWG, and I have no qualms with them, but they seemed to be the biggest complaint, so I would like to hear what they had to say about it. When you are compentant and an asset, being eccentric is acceptable. When you are not, it just gives people more fodder to make fun of you. I know a lot of people nationwide, myself included, used to hold HM in high esteem. ...we were wrong. Pick one. Again, this is so disappointing to me personally. I am now in the position of still encouraging my cadets to attend because of the overall growth experience of the camp experience itself, while at the same time I wouldn't call those guys to help me direct traffic at an air show. Real, sustained, ES work is not the same as a bivouc or even SAR work where the state's infrastructure is still intact. IL people went down there concerned we would have what it takes to actually help people. We understood that as volunteers, with day jobs, our skills would not necessarially be up to par with others we were working with, but we'd do our best. As such, we made an effort to foster relationships w/ the Army, USAF, and the EOC. Our motto was "STFU - execute the mission as briefed". Which is what we did, and we had some success. We were prepared to stay longer, but the situation no longer required our help and most Federal assets were being ordered out of MI at that point (the Army was packing up as we were leaving). The PAWGs thought they could run the whole show, and knew better than everyone else. A) They didn't, as was evidenced by the fact that within two hours of arrival IL had base camp in place and bagan running sorties (much to the surprise of PAWG). B) Even if, in a wild fantasy, PAWG really >DID< know better, there is a thing called the "chain-of-command". Either you accept it and do what you are TOLD, or you don't and you are sent home. I'd be willing to believe that - in which case yo have a bunch of "pretenders" down there. on their call sign, which is "Penn-Cap", not "Ranger Team 'X'". We wouldn't take such pleasure in this if they weren't so damn arrogant. As for the kilts, what does it matter as long as it wasn't done on duty time? It was at night, at our base, and if you had been wearing BDUs for 12 days straight with one shower, you'd want to air out a little too. As for the orange T-shirts, that's always the 'PAWG thinks they can do whatever they want thing.' So be it. Our shirts had the organization name on them identifying who we were with, which in my opinion is much better than an olive drab shirt. Be honest, When it's 100 degrees outside, you don't want to wear a blouse. Even the Texas teams shed the blouses. Go bust on them a while to be fair about it. The cadets were sent before an age limit was ever imposed. In fact, we got pulled out of during our duty work because of being underage half way through. Up until then they wanted us out in the field, and we were. As for blowing off search grids, you weren't there, don't talk. We had a full, large grid map setup in the trailer and we stuck to what grids they told us to search and recorded what houses and what roads we covered and marked them off on our grid map and reported them to Jackson. As for 'sitting around and playing cards and making directional arrows', that was after we got pulled out of the field for being underage. It wasn't our fault that we got pulled out because someone higher up deemed that going door to door and interviewing people who had functional cars, TV, stockpiles of food, and a twig on their lawn was too dangerous. We had so much free time on our hands it was ridiculous. What did you expect us to do? Oh, not only did we play cards and make a sign tree, we also practiced DF skills on base since there was an ELT going off (which we successfully silenced), stretcher packing, and other things. Again, how would you know? You weren't there and you're just speculating. As for the base sign? That was made before we even left PA. Again, more speculation that makes you look completely ignorant. How mature of you to call it 'Hurl Mountain'. We WERE authorized to take the MREs, and they were to replenish what we brought down from Hawk Mountain, nothing more. To my knowledge, Hawk doesn't even sell MREs. Also, we had no communications because our sat phone never worked well and the radios for some reason couldn't get in contact with Jackson. We had to relay to Highbird our information and they (supposedly) sent it over. Also, to whoever was complaining about how 'elaborate' our base was: It was setup in a matter of a few hours. We had no orders at the time, or any sorties, or else we would've been in the field. None-the-less, I'd hardly call a parachute canopy and three large tents 'living in style'. Those at Stennis, Wiggins, and ESPECIALLY Jackson had it infinitely nicer than the Stennis teams. ILWG had it even worse after PAWG left. "75% of the PAWG Team in MS were not Hawk Mountain types and/or had never been to a Hawk Mountain School"
Most good CAP officers succeed IN SPITE of the organization, not because of it. The AAR confirms it again - it's like seeing a new version of the same movie over and over again. If 9/11, Katrina, etc. can't get our leaders -- CAP and USAF -- to make the tough decisions to get CAP out of its never-ending schizophrenic spiral, what will? If not now, when? One section of the AAR describes how the lack of a qualified information officer was a serious issue and "something that should not be overlooked in the future". Well, I'm a qualified IO (and GTM/MO/AOBD) and everyone in my whole chain of command knew it. There are at least two in every wing...why weren't qualified people sent down there when specific skill sets were being requested by IC's? We're a national asset, one of the few around (volunteer, anyway) that can mobilize people to just about anywhere. In addition to the things spelled out in the AAR, we need to use Katrina to learn how to get a large number of the right people into the right spots at the right time - a skill I don't think CAP has had to use for decades, if ever - and make sure our training, attitudes and egos are all where they should be. Oh, and anybody have the heart to tell Dallas Composite Squadron that they're spelling "Auxiliary" wrong on the cover of the AAR? "...Again, how would you know? You weren't there and you're just speculating..."
Illinois Wing Katrina Deployment 7-14 Sept 05. 7 days deployment, 5 days working. I have about 900+ photos and some video. I apologize I can't post more as they are not with me at the moment. I will as soon as I can. "...We had so much free time on our hands it was ridiculous. What did you expect us to do?..." GO HOME - just what is needed in a FOB during a catastrophe - a bunch of cadets with nothing to do and limited supervision. PAWG was >NOT< authorized to take those MRE's. The term "theft" was used all the way up the chain, and I imagine that the only reason we haven't heard more on this, is because it's either still in the works, or someone decided that in the grand scheme of a $50-billion tragedy, $5-10k of MRE's isn't worth the hassle. Replenishment means "what you used" - "not what your whole state used in 2005". PAWG took home at least 90 (nine-zero) cases. That's at LEAST 900 (nine hundred) meals. You were there like a week. How much do you guys eat? "…We filled each and every van with about as many MREs that we could fit without suffocating ourselves with them..."
And we have no idea how many heater meals and MOD meals have made it into the PA school lunch program, but there was next to none of those left when we got back the day you left. And yes, you left us some coolers and drinks, along with a bunch of loose random MRE parts - thanks, you guys are so KEWL! mine is the blue tent. - it was all we needed. No camp lights, no dining hall, the only generator was in the ICP (yeah we had more), which for the record, had white boards, and even some paper and pencils 'n other neat stuff like that. We showed up, pitched our camp and ran sorties. At night we sat in the dark, discussed the day and watched the stars. Now, we know what we actually >saw<, and heard further scuttle that happened outside our view. I won't throw that out here, but is was no more flattering than what is detailed here or in the AAR. On the way down into Jackson, most of the radio chatter, and on most lips when we arrived at Mission Base was "WTF is going on down at Stennis?" Resulting finally in the trip required by the IC personally to try and straighten things out, after which PAWG was sent home. I can tell you for a fact there wasn't 90 boxes. The vans were pretty tight, but that's not saying much since they were crammed full of people and other belongings anyways. Believe what you will since at this point there's no point in trying to change views. Believe what you want about how we 'stole' whatever. There's been enough debate about that by other people over at CadetStuff. D on Can CAP Become as Relevant Now as 1941? Account Deleted on Witch Hunt? Account Deleted on Can CAP Become as Relevant Now as 1941?